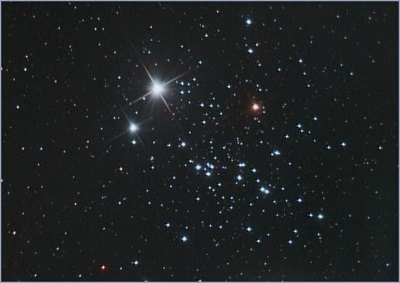 NGC 457 is the brightest open cluster in Cassiopeia and one of the finest objects of its type in the northern sky. At magnitude +6.4, it's just beyond naked-eye visibility but easily seen with binoculars and a beautiful sight through telescopes. The brightest cluster stars are arranged in prominent lines and curves that resemble an Owl shape, hence the popular name "The Owl Cluster". 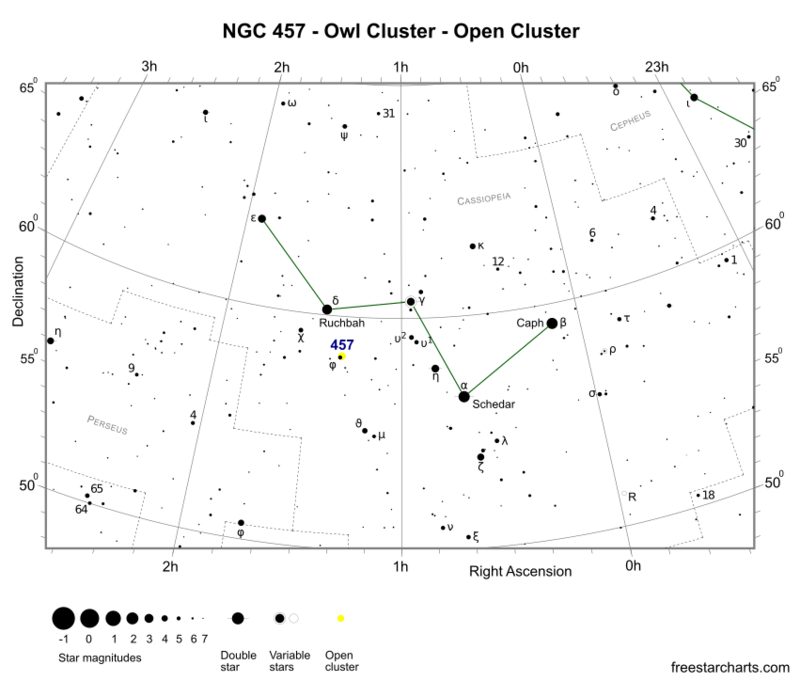 NGC 457 was discovered by William Herschel in 1787. Finding the Owl Cluster is easy as it's located two degrees south-southeast of eclipsing binary star system Ruchbah (δ Cas - mag. +2.7). This star is one component of the characteristic "W" asterism of Cassiopeia. The brightest star inside NGC 457 is Phi Cassiopeiae (φ Cas - mag. +5.0). Despite not being a member of the cluster, this foreground star is visible to the naked eye. Together with another non-cluster star, seventh magnitude HD 7902 (HIP 6229), they form the bright eyes of the Owl. NGC 457 is best seen from Northern Hemisphere latitudes during August, September and October. It appears high in the sky and even overhead from many locations. From latitudes greater than 32N, the Owl is circumpolar and therefore never sets. Through 7x50 or 10x50 binoculars, the two brightest stars form a lovely double star separated by 135 arc seconds. With averted vision and especially on nights of good seeing, the brightest cluster stars hint at resolution against the hazy backdrop. A small 80mm (3.1-inch) refractor reveals a fine cluster consisting of two dozen mostly white stars with the brightest pair yellow and blue in colour. A group of 9th and 10th magnitude stars in a rectangular shape form the body of the Owl, with the arms extending outwards in a north-south direction. Medium size 200mm (8-inch) reflectors, reveal a stunning sight with up to 100 stars spread across 20 arc minutes of apparent sky. Easily seen is the cluster's brightest member, a magnitude +8.4, deep orange ruddy coloured supergiant star. Since not included in the Messier catalogue, NGC 457 is often overlooked and not so well known as other bright clusters. However, this beautiful group of stars is one of the best open clusters in the northern sky. It has an estimated age of 21 million years and is located 7,900 light-years distant. The cluster is number 13 in the Caldwell catalogue.